The common units recognize that student success lies in their ability to make a successful transition into academic study and become active and confident participators in the university learning community. To assist this, it is essential that students are provided with the academic skills up front and are respected and recognized for their diversity in culture, age, economic background and educational attainment. We encourage students to discover the value of what they bring to the learning experience as individuals and design assessment and learning experiences that value differences in culture, learning style and educational background. Recognition of the following aspects of diversity is particularly important. We recognize that the standards achieved by students in the units will vary and that some students will be required to make a great deal of effort to achieve minimum standards. This may often reflect the language or educational disadvantage a student has begun university with but does not reflect the student's ability to build these skills to a higher standard with further experience and exposure to academic language and culture as they progress through their course. Students increasing diverse cultural backgrounds also impact upon their knowledge, learning approaches and skills so learning materials, tasks and assessments are designed to encourage students to draw on their prior knowledge and experience to enhance their learning. Another dimension of this diversity is the fact that students attending the program are from all disciplines. Consequently, our students bring diverse levels of prior experience, interest and knowledge to the strong language and humanities orientation of the common units (particularly CUC100 and CUC107). A supportive approach is employed by Common Unit teaching staff to encourage, motivate and inspire students' confidence in their ability to learn and succeed in their study. This approach requires staff to be able to empathise with the diverse skills, knowledge and backgrounds that they arrive at university with. It involves assuming the role of teacher as mentor rather than teacher as didactic gatekeeper. While teaching staff are not expected to solve these issues, empathy, flexibility and initial diagnosis and referral can improve the experience and success of International students enormously. Fairness – assessment and learning experiences should be culturally and stage appropriate, adopt an educative approach to plagiarism, explain assessment expectations clearly. Utilising mentoring from both peers, through group work, and from teachers. Responsiveness – understanding that students learn through experience and enquiry so responding to individual students' enquiries is an essential part of the teaching role. We aim to reply to students emails and queries as promptly as possible, just in time, in a respectful, helpful way (no question is too stupid) that is emphathetic towards individual student’s needs. A flexible approach is important because of our students’ diverse backgrounds. The assessment and learning activities in our units need to be flexible so all students can access the skills and knowledge for academic success. We also support students by adopting a collaborative mentoring approach rather than a didactic punitive one. Assignments students are presented with a range of different kinds assignments and a flexible approach that allows students to access the support they need in understanding and completing them. A developmental approach is also an essential aspect of empowering students. This approach recognises that the levels of skill development relate to the levels students begin with and the need to provide adequate support (scaffolding) for students to succeed. Moreover, skills and knowledge introduced in the common units are pitched at a level that assumes no prior knowledge. It is assumed this base-level provided in Common Units will be developed and perfected as students’ progress through each year of their course. Part of a developmental approach to students learning is to assist students in going beyond what they already know, while at the same time providing them with enough support (scaffolding) to succeed. Scaffolding is provided by peers and teachers through a transactional social approach to learning. Sequenced from less to more challenging, so that initial assessments, readings and learning activities are accessible (concrete) and non threatening allowing students to build up skills, knowledge and confidence for subsequent more demanding conceptual learning tasks. Formative and provide experiential learning opportunities. Facilitates the development of self assessment (reflection) in learning. Encourages teacher and peer dialogue around learning. Helps clarify what good performance is (goals, criteria, standards expected). Provides opportunities to close the gap between current and desired performance. Delivers high quality information to students about their learning. Encourages positive motivational beliefs and self-esteem. 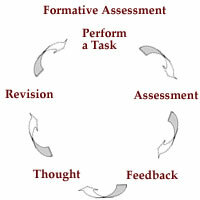 A formative approach to feedback is described by Culley (2006) as consisting of a cycle that allows students to reflect and revise a task after it has been assessed.